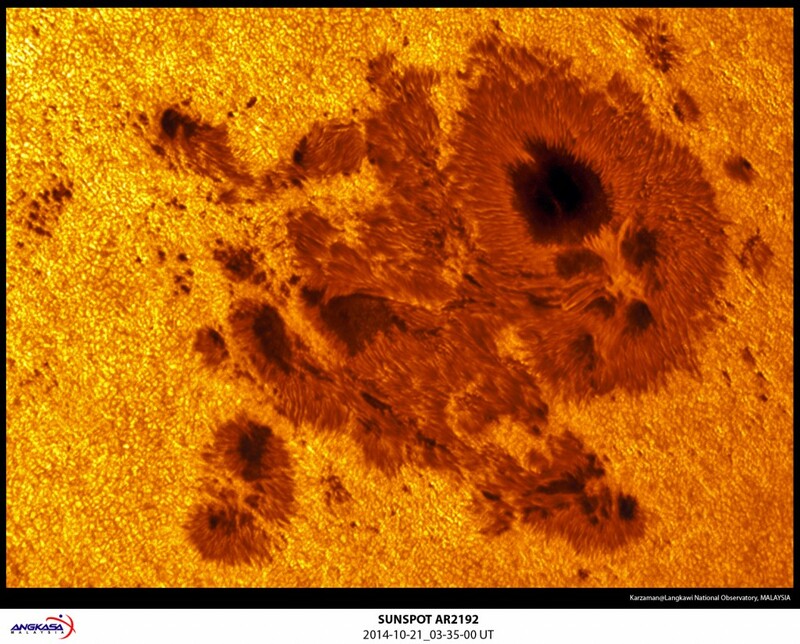 By the time the giant spot on the sun rotated into view on October 18, it was already 80,000 miles wide, big enough to fit all of Jupiter, big enough to lay 10 Earths, side by side, across. It is the largest spot the sun has harbored in 24 years. But while most erupting sunspots lob chunks of plasma outward in events called coronal mass ejections, this one’s keeping its plasma close to the surface. The sun is not a solid body. It’s a ball of hot, hot ionized gas called plasma that’s threaded with magnetic field, created by charged particles moving around. The sun spins faster at its equator, and the result is that some of that magnetic field drags, getting twisted and knotted up in the process. As this happens, these knots of magnetic field gain energy, pressure and buoyancy, and some of them float to the surface, and penetrate it, popping out. The result: a spewing forth of ionized gas. Releasing this pent-up energy typically takes two forms: a solar flare or a coronal mass ejection, and this is key to what makes the behavior here unusual. A coronal mass ejection is made up of balls of gas ejected from the sun’s outer atmosphere, consisting of charged particles and magnetic field. The fastest CME’s travel up to 93 million miles a day, or millions of miles per hour. A solar flare is a burst of x-rays and energy, typically smaller and shorter-lasting than a CME, and rather than being launched out into space, it is caused by material accelerated back into the sun. 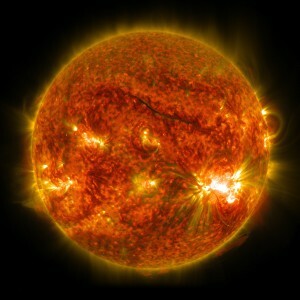 But it’s produced 10 major solar flares, Hesse said. Six of these were rated X-class, which is equivalent to 100,000 times the amount of energy produced by humans in one year. Also, a billion Hiroshima-sized nuclear weapons. 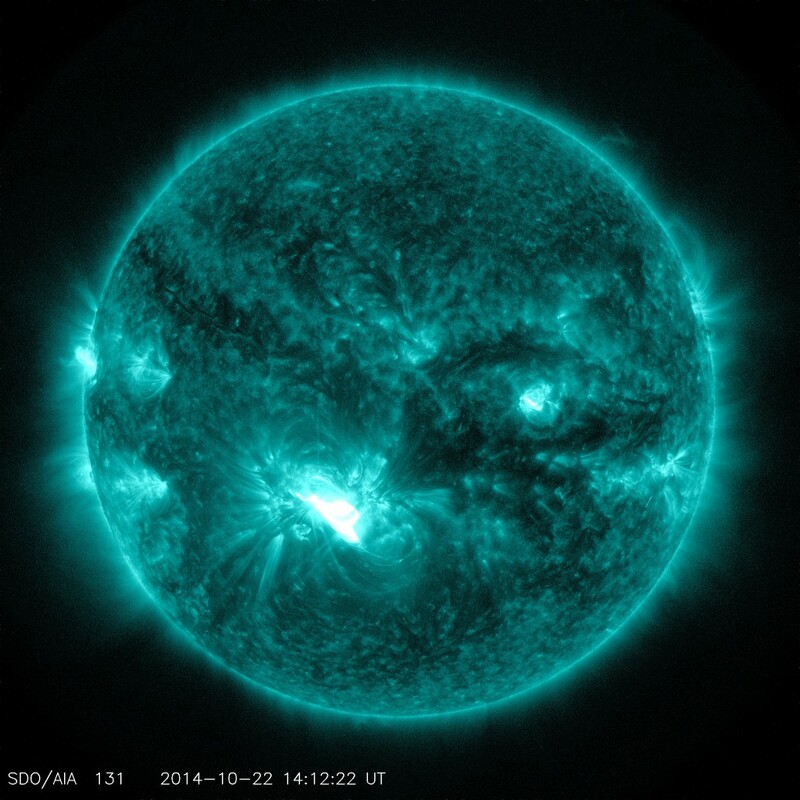 About 20 percent of all of the X-class flares produced so far in this 11-year solar cycle have come from this sunspot, said Dean Pesnell, a project scientist with NASA’s Solar Dynamics Observatory, which takes about 100,000 pictures of the sun every day. When a solar flare erupts, it lights up the side of the Earth that’s facing the flare, and heats up the Earth’s upper atmosphere, or ionosphere, which can temporarily change its properties. 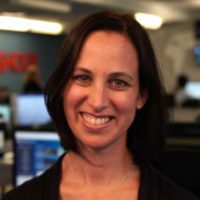 Solar flares pose less danger than CME’s, but they can affect short-wave radio communication used by pilots and ships, since the radio waves are bounced off the upper atmosphere. On the NewsHour Oct 30, Miles O’Brien reports on the lava flowing from the volcano on Mount Kilauea in Hawaii and the Jupiter-sized sunspot, which just rotated out of view. Sunspots, first seen through a telescope by Galileo, are classified by how complex they are. Similar to a mole, a clean, round sunspot is of less interest to sun watchers. Likewise, a more complicated structure means a sunspot contains more potential energy. And as this sunspot goes, it’s a funky one, large and complex, slightly surpassing in size the two spots that existed in fall 2003. That was a time of extreme solar activity, known as the Halloween Storms. And those 2003 spots produced the biggest flares we’ve seen in modern times, Young said. But this spot has its own mystery, and Hesse expects it to feature prominently at upcoming science conferences.